The inspiration for this tapestry kit comes from the 'Odes' of the Latin poet Horace. 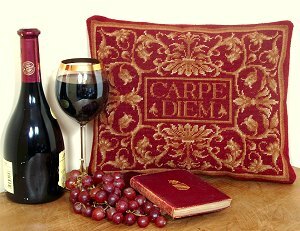 The full quote is Carpe diem, quam minimum credula postero “Seize the day, trusting little in tomorrow”. From Roman times to the present day, it has served as a reminder to live your life to the full. The kit uses Appletons tapestry wool on 12hpi canvas and measures 14 x 11 ins (37 x 30cm) suitable for a pillow or cushion. Contents: Zweigart tapestry canvas, tapestry wool, black and white chart, needle and instructions.